This post originally was written by us for Craft Carolina. You can find it here: http://www.craftcarolina.com/2016/07/25/how-to-read-a-wine-label-by-the-nc-wine-guys/. Shopping for wine can be a fun if you know what you want. On the other hand, it can also be a daunting experience. Unless you’re in the business, sometimes those wine labels can be confusing. We’re here to help. 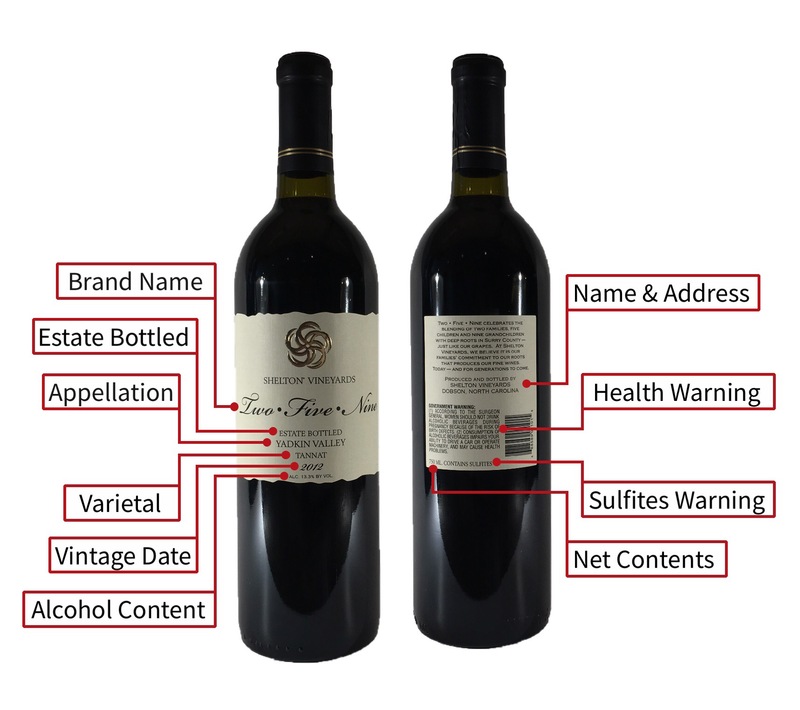 We’re going to take a look at how to read an American wine label. European wine labels are a different animal for a different time. We’ll look at labels for wine made right here in the USA. In particular, we’ll look specifically at a North Carolina wine label. Label standards in the US are regulated by the US Alcohol and Tobacco Tax Bureau (TTB). The regulations are defined in the Code of Federal Regulations (CFR). Per their website, the TTB works to ensure that alcoholic beverages sold in the US are properly described on their containers. The TTB goes on to state that they review over 100,000 labels and advertisements each your to ensure that they comply with Federal regulations. You can find more information at the TTB’s site. It was used for most of the information in this article. Here is a link: https://www.ttb.gov/pdf/brochures/p51901.pdf. Brand Name – This is the name used to market the wine. This is the year in which the fruit used in the wine was harvested. If state or county is used as an appellation of origin, then 85% of the fruit in the wine must have been harvested in the vintage year. If a viticulture area is used, then 95% of the fruit in the wine must have been harvested in that vintage year. This is used when 100% of the fruit came from a vineyard owned or controlled by the winery. The winery also must have processed the wine in its entirety at the winery. This is the name of the grape variety that comprises at least 75% of the wine. If this designation is used, then an appellation of origin is required. This means that the 75% must have all come from the appellation of origin. The above rules only apply to vitis vinifera grapes (Cab Sauv, Cab Franc, Merlot, Chardonnay, Sangiovese, etc). For vitus labrusca grapes (Concord, Catawba, Niagara, etc), the requirement is only 51%. As the varietal designation is not required, other designations may be used. These include Red Wine, White Wine, Rosé Wine, Table Wine (< 14% Alcohol) or Dessert Wine (> 14% Alcohol). Appellation of Origin – This can be the state, county or geographic region in which 75% of the fruit in the wine was grown. This is the American Viticulture Area (AVA) in which 85% of the fruit in the wine was grown. An AVA is a designated wine grape growing area within the US so designated for its distinctive geographic features. This is the name and address of the bottler of the wine. The designation of “Produced” can be added to designate that at least 75% of the wine was fermented at the address listed. The designation of “Vinted” can be added to designate that the wine was cellared at the address listed. This is the alcohol by volume of the wine. Wine that is between 7% and 14% alcohol can be labeled as “Light Wine” or “Table Wine”. This is the net content of wine in the container in metric units. Wine can be bottled in 50ml, 100ml, 187ml, 350ml, 500ml, 750ml, 1L, 1.5L or 3L sizes. Bottling greater than 3L is allowed at even liters only. Health Warning Statement – This is required on all beverages at 0.5% alcohol or greater. This is required on any wines that might be sold across state lines where the wine contains 10 or more parts per million of sulfur dioxide. It is not required for wines only sold within a single state.